Green have hopefully anticipated the building of a Main Post Office on the corner site of New Road and Winton Drive. Many residents will recall that the main post office in Watford Road was housed in a temporary building until such time as the former G.P.O. could finance the provision of a new building on the land which they already owned. 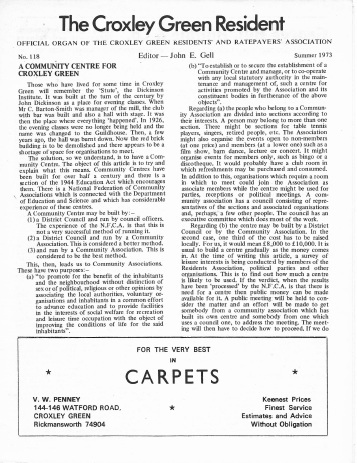 Our members will remember the Association's strenuous efforts to retain the facilities of the main post office (which used to be open from 8.30 a.m. to 6 p.m. on every weekday) but the (then) newly constituted Post Office Corporation contended the volume of business at that office did not make its further life an economic proposition. Consequently, the main post office was closed and facilities were remitted to sub post offices. The Association has repeatedly sought to learn the intention of the P.O. Corporation towards the land they owned (which has been temporarily rented by the taxi firm). Now the land has been offered to the County Council and Rickmansworth U.D.C. The former considered building a Medical Centre but apparently rejected the idea. The Local Authority propose to buy the land for council housing purposes and to erect five three-storey houses. 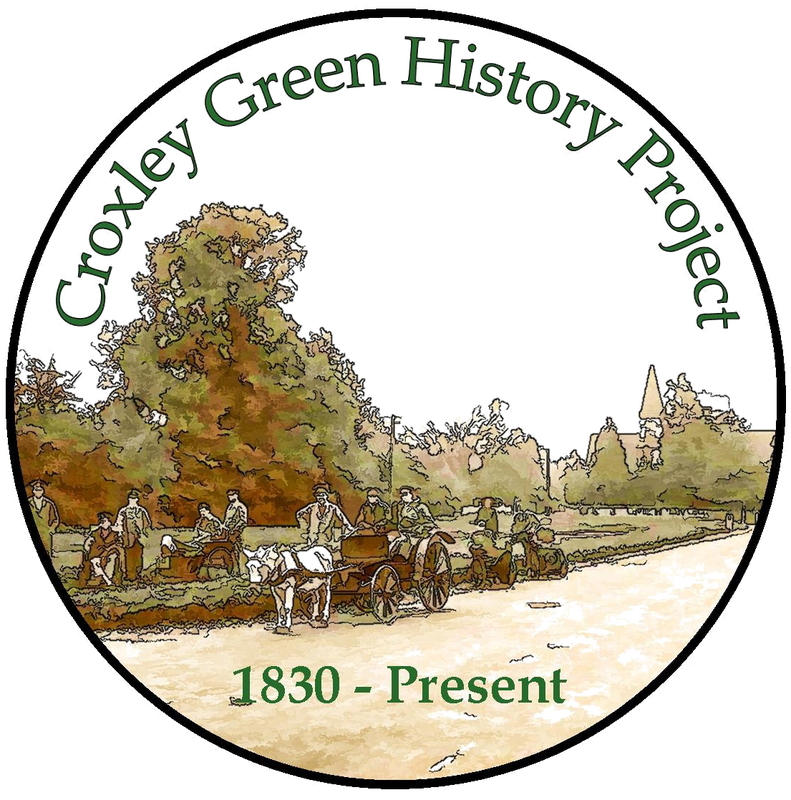 Efforts have been made to convince the Council, and particularly, six of the Croxley Green Councillors, that this site is an important one to Croxley Green. ​CROXLEY CAMERA CLUB - The first meeting of the Croxley Camera Club after the summer recess will be on Wednesday, 5th September, at the Rickmansworth Sports Club pavilion. New members will be welcomed as well as visitors who will have the chance to admire the scope of the Club's activities. Further information can be obtained from the Secretary, Mrs F. Howard - telephone Rickmansworth 73533. At the Film Show presented by the Croxley Green Society last March, the slide show "Across Siberia to Japan" was given by Mr c.L. Smith, O.B.E. (and not by Mr Wilson as previously reported). 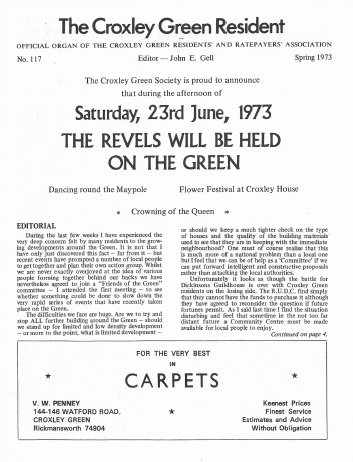 Several people missed the cine show of The Revels and other Croxley Green views on this occasion and we would ask the Croxley Green Society to repeat this enterprising event. 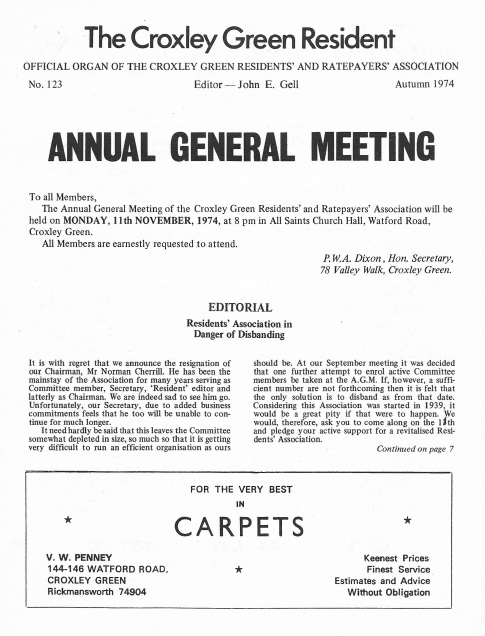 ​THE FUTURE OF YOUR ASSOCIATION - Our Annual General Meeting on 14th November must be the time to strengthen the administration of the Association. We need a President, preferably two Hon. Treasurers (one to manage the accounts and one to control subscriptions), a Press Officer, an Advertisements Officer, a member or panel of members to examine plan, applications, a panel to deal with transport problems involving buses and trains, a person with tree expertise and a panel to deal with highways matters. 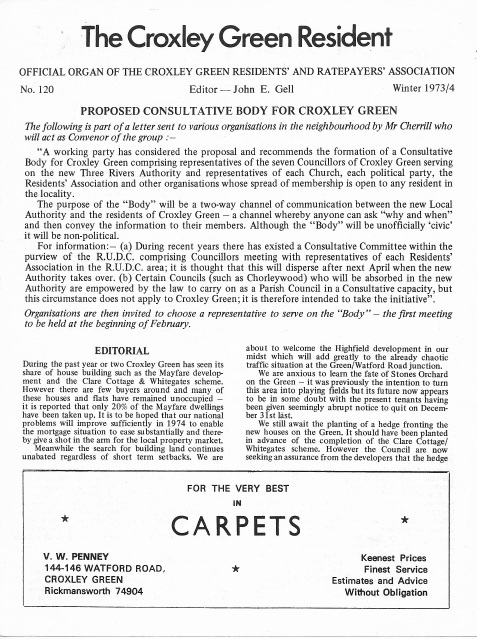 The Association was formed in 1937; its objective is to preserve and improve the amenities of Croxley Green. Our homes in Croxley Green are our palaces! The two local authorities must be constantly kept informed of the things we want and the things we do not want. 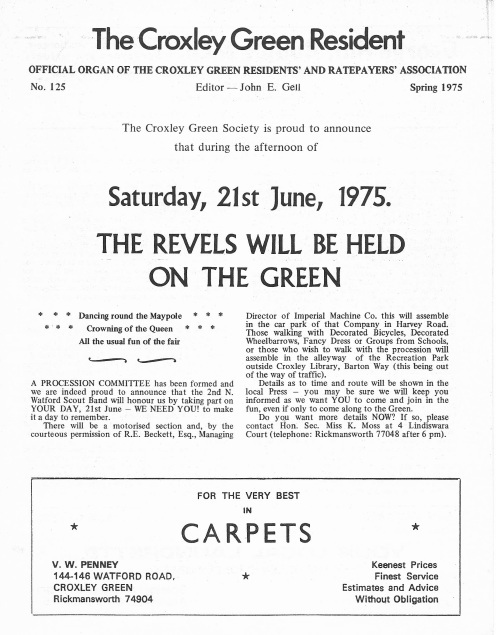 Until now Croxley Green has comprised 40% of the total area of Rickmansworth U.D.C. (and part of Watford Rural D.C.) and has contributed the same percentage to the local rates. 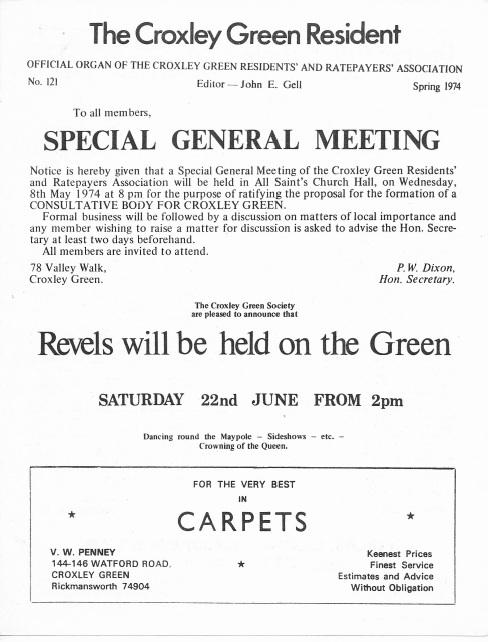 From the advent of the new Three Rivers Authority next April (we still dislike that name) Croxley Green will comprise a much smaller proportion of the enlarged area. 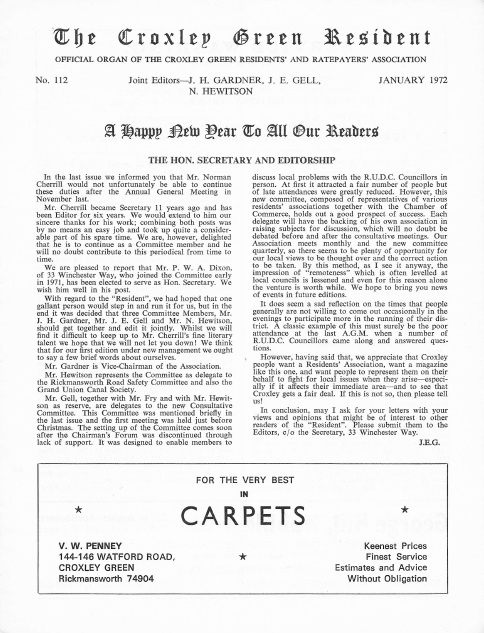 Whereas until now we have been a large pebble in the pond, from next year our strength will be shown by our exertions to secure satisfactory local treatment by the new authority because other localities will be pressing for the things they still want. If we all consider ourselves as shareholders of the local authority we must not be sleeping contributors; we must not sit back and watch our investment wasted. The West Herts Main Drainage Board is a remotely controlled authority; the County Council nearly the same; the Eastern Roads Construction Unit and the Department of the Environment somewhat similar. There is undoubtedly a wealth of knowledge and experience among our members - please do not be backward in coming forward to take an active part in the Association which seeks to serve your interests. - F.N. Cherrill, Chairman. ground, the laying of kerbs and the making up of the carriageway. It will be recalled that in June last year it was decided that either a waiting bay be constructed within the grounds of the School to enable patents to park off the road in Lincoln Drive or, alternatively, to construct a turning bay at the end of Lincoln Drive. The Council Engineer has consulted the County Education Officer and it has been decided that the waiting bay scheme should go ahead and that the turning bay would not now be required. The Council have recently decided to purchase this property and land for housing purposes at the District Valuer's figure of £96,000. SCOTS HILL HOUSE - As previously recorded outline planning permission has been granted for the demolition of the existing house. and the erection of 6 houses and garages together with an estate road. Details of the landscaping conditions are as follows: a) the retention of the hedge along the western boundary , b) providing additional trees on that boundary within 9 months of the starting of the development to the satisfaction of the Council; c) the remainder of the landscaping will be carried out within 6 months of the completion of the development, d) landscaped areas will be subsequently maintained including the replacement of any tree or shrub which may fail within 5 years of it being planted. e) without written consent of the Council none of the existing trees on the site or the shrubs on the land fronting Scots Hill shall be removed and these trees will be protected during the building operations to the Council's satisfaction. by Dareves Moulding Mills. The Council have imposed certain conditions to secure adequate parting and servicing facilities and a scheme of landscaping must be submitted to the Council for approval. been received on this subject since the idea of providing more facilities on Common Moor was first raised in the 'Resident'. We would point out that the suggestion waspurely a personal one of the contribu tor concerned and not that of the Residents' Association. At least one Croxley Councillor has publicly attacked such an idea. erection of4 garages at the rear of 245 New Road. The application was submitted by E.J. Gray and Son Ltd.
We are greatly encouraged by the warrn-hearted support which Holiday Adventure has received from the families of Croxley Green, and so that you may be aware of the dates for next year's Adventure when planning your holidays, we are pleased to make a brief announcement of the outline plans which we hope to amplify in the next edition. It is hoped to hold HOLIDAY ADVENTURE '75 during the week of July 28th to August 1st, and EVENING VENTURE for older young people during the week of August 4th to 8th. JUNIOR ADVENTURE for the three to five year olds, which is a new endeavour in response to the wishes of mothers who have children who are not old enough to participate in Holiday Adventure, will probably be held on the mornings of August 6th, 7th and 8th. We shall not be accepting any enrolments until the beginning of next year, but if we can help in any way, please telephone Rev. Keith Moyes, Watford 31403 or Edward Lambden, Adventure Office, Wa tford 44119. The Council have made a grant of £250. ​HIGHFIELD ESTATE - Proposed Council Purchase. The Council are considering the offer by the developers of this estate, Bryant Homes, to sell 60 houses and flats for occupation between September 1975 and July 1976. Approval has to be sought from the Department of the Environment. The Council is also waiting to see the Housing Capital Estimates which should be ready soon before entering any agreements with the Company. 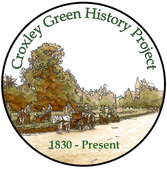 FRIENDS OF THE GREEN - The Green Conservation Area. 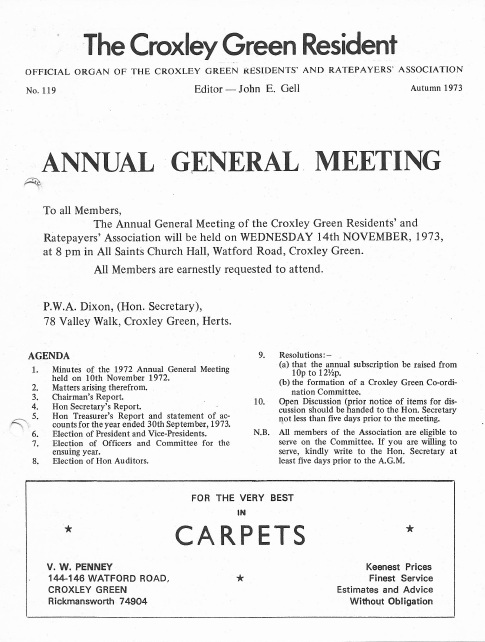 A General Meeting was held on 4th December in which details of the Society's latest moves towards the establishment of a Conservation Order for the Green were given. A large plan of the Green showing the boundaries of the area, very gratefully produced by Mr. Julian Thompson of F.J. Thompson & Company, New Road was shown. A booklet is now being prepared with photographs, maps and text, copies of which will be distributed to- District and County authorities. the opening of the North Orbital later this year. The District Council are now trying to persuade the County to make some sort of temporary provision for pedestrians. A reply is awaited. ​Horse Riding on the Green. Plans are being made to ban horse riding on the Green in front of Croxley House. Green. One does have a great deal of sympathy with the majority of riders, some of whom come quite a considerable distance, who will have their pleasure curtailed because of a selfish few. It is hoped that, even at this late hour, some compromise solution can be worked out. before another life or limb is lost. 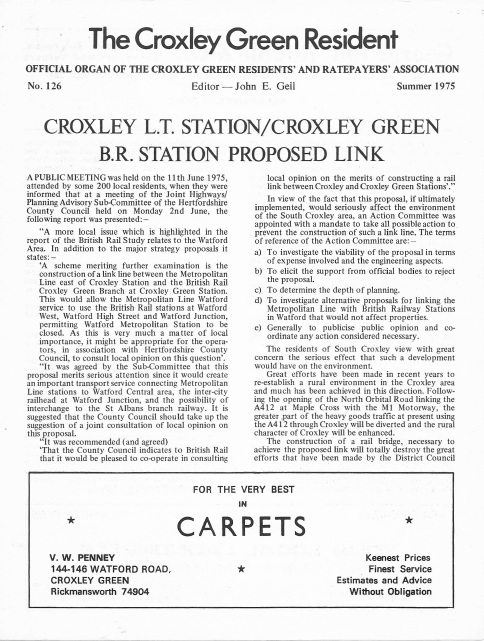 Councillor Robinson put forward the following motion to Three Rivers D.C.; "This Council notes the suggestion from British Rail that a link line should be built between the Metropolitan line east of Croxley Station and the British Rail Croxley Green Branch at Croxley Green Station. The Council having noted the severe disruption that would be caused, herewith informs the Greater London Council that it could not support such a scheme." 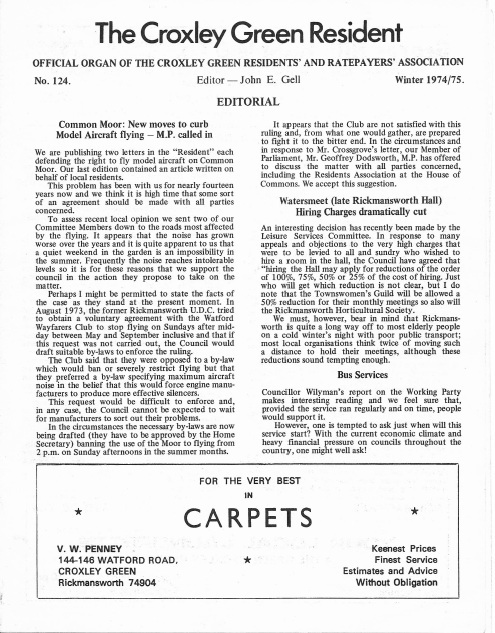 The Planning Committee, to which the matter was referred, had before them a letter from Wing Cmdr. 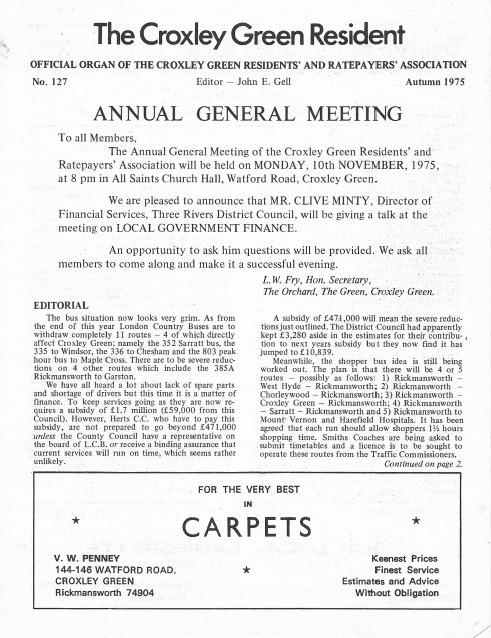 Hatton, who contributed to this journal in our last edition, conveying the concern expressed by residents of South Croxley at the proposal. The Committee expressed their concern at the possible disruption and the threat to properties if the scheme were to go ahead. 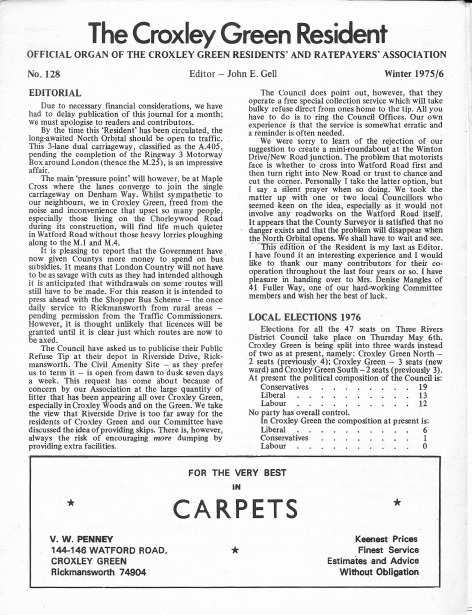 It was decided that: I) the County Council and the G.L.C. be informed of the Council's concern at the social and environmental implications of the proposals and 2) the County be asked to supply relevant information in connection with the South West Herts. Transportation Study. which residents' ideas on the type of facilities they would like to see provided were sought, the Community Association have now approached the Council with a view to a loan to help them with their next step. It is proposed to rent some land next to the Youth Centre and then to erect a prefabricated concrete building which would cost in the region of £40,000. In view of the economic situation, it is understood that a suitable loan will not be forthcoming at the moment, although there is considerable Council interest in the project. A Sub-Committee of four councilors has been set up to liaise with officers of the Community Association. CRESCENT CARS - It has been finally agreed that the taxi firm can use the Red House Car Park in Watford Road, but there are a number of conditions to the deal. The position is slightly complicated by the fact that the Council lease the car park from the brewers who own it. The conditions are (a) that no specific parking spaces are to be reserved; (b) cars waiting in the car park for the purpose of private hire not to exceed four in number at anyone time; (c) the driver of a private hire car waiting in the car park is not to ply for hire or accept passengers for hire; (d) permission granted to be subject to review by the Council at any time. One brighter note can be directed to the residents of Ascot Court in Winton Drive. It had originally been proposed to place a cab rank on the opposite side of the road which resulted in many objections from the residents. The outcome is not, however, very satisfactory for Crescent Cars, but it appears to be the best way out of a difficult situation.